1 Short title and commencement.—(1) These rules may be called the Indian Postal Service (Group 'A' posts) Recruitment Rules, 2017. (i) "Other Backward Classes" shall comprise the castes and communities notified by the Government from time to time. (k) "Service" means the Indian Postal Service, constituted under rule 3. (l) "Schedule" means the schedule annexed to these rules. 3 Constitution of Service.- (1) There shall be a constituted Service known as Indian Postal Service, Group 'A' consisting of persons appointed to the service under rule 6 and 7. (2) All the posts included in the service shall be classified as Group 'A' posts. (3) The regular continuous service by the officers, as referred to in sub-rule 3 (1) in the respective corresponding Grades, rendered prior to commencement of these rules shall be counted as qualifying service for the purpose of seniority, confirmation, promotion, non-functional up-gradation and pension. 4 Controlling Authority.—The Government of India, Ministry of Communications, Department of Posts shall be the Controlling Authority of the Service. 5 Grades, authorized strength and its review.—(1) The authorised permanent strength of various Grades of the Service on the date of commencement of these rules, the number of posts in each Grade and the level in the pay matrix attached thereto shall be as specified in Schedule-I. (2) On and from the date of commencement of these rules, the authorised permanent strength of various Grades of the Service shall be as may be determined by the Central Government from time to time subject to variation depending on workload. 6 Members of Service.— (1) The service, shall on the date of commencement of these rules, consist of officers who have already been appointed to the Indian Postal Service, Group 'A' in the various grades specified in Schedule-I on a regular basis. (2) A person appointed to any duty post in any grade after the commencement of these rules shall be a member of the Service in the corresponding grade, from the date of such appointment. 7 Appointments to the Service.—(1) After initial constitution of the Service, the vacancies in any of the grades shall be filled in the manner as hereinafter provided. (2) Fifty per cent of the vacancies of Junior Time Scale shall be filled by direct recruitment on the basis of Civil Services Examination conducted by the Commission in accordance with rules framed and notified by the Government from time to time. (3) Remaining fifty per cent of the vacancies in the Junior Time Scale shall be filled by promotion of Postal Service, Group '13' in level 9 in the pay matrix (Rs. 53,100 - 1,67,800) and Senior Postmaster Grade in level 8 in the pay matrix (Rs. 47,600 - 1,51,100), in accordance with the provisions specified in Schedule-II in consultation with the Commission on the basis of the recommendations of the Departmental Promotion Committee constituted in accordance with Schedule-III. 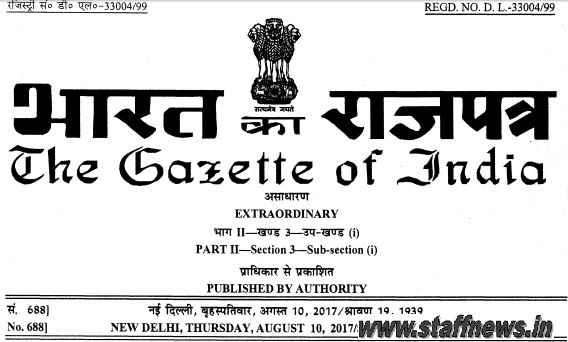 (4) Appointments in the Service to the posts of Senior Time Scale and above except to the Junior Administrative Grade (Non-functional Selection Grade) shall be made in accordance with the provisions of Schedule II, by 'selection' on the basis of the recommendations of the Departmental Promotion Committee constituted in accordance with Schedule-III. Placement to the Junior Administrative Grade (Non-functional Selection Grade) shall be made on the basis of seniority subject to suitability on the basis of the recommendations of the Departmental Promotion Committee constituted in accordance with Schedule-III. Provided further that any decision for extension of the probation period shall be taken ordinarily within eight weeks after the expiry of the previous probationary period and communicated in writing to the officer concerned together with the reasons for so doing within the said period. (2) On completion of the probation or any extension thereof, officer shall, if, considered fit, for permanent appointment, be retained in his appointment on regular basis and be confirmed in due course against the available substantive vacancy, as the case may be. (3) If, during the period of probation or any extension thereof, as the case may be, Government is of the opinion that an officer is not fit for permanent appointment, Government may discharge or revert the officer to the post held by him prior to his appointment in the service, as the case may be. (4) During the period of probation or any extension thereof, candidate may be required by the Government to undergo such courses of training and instructions and to pass examination and tests (including examination in Hindi) as the Government may deem fit, as a condition to satisfactory completion of the probation. (5) As regards other matters relating to probation, the candidates shall be governed by the orders or instructions issued by the Government from time to time in this regard. Provided that if the seniority of any Member of the Service has not been determined before the commencement of these rules, it shall be determined by the Government in accordance with the general instructions issued by the Government from time to time. (2) The seniority of the persons recruited to the Service after the initial constitution shall be determined in accordance with the general instructions issued by the Government from time to time in this regard. (3) Seniority of officers not covered by the above provisions shall be determined by the Government in consultation with the Commission. 10 Non-Functional Up-gradation.---(1) Whenever an Indian Administrative Service Officer of the State of Joint Cadre is posted at the Centre to a particular grade carrying level 10 to level 15 except 13A in the pay matrix, the officers belong to batches of the Service that are senior by two years or more and have not so far been promoted to that particular grade, shall be granted the same level in the pay matrix on non-functional basis from the date of posting of the Indian Administrative Service Officers in that particular grade at the Centre. (2) All the prescribed eligibility criteria and promotional norms including 'benchmark' for up-gradation to a particular level in the pay matrix shall have to be fulfilled at the time of screening for grant of higher level in the pay matrix. (ii) made on the recommendations of the screening committee as specified in Schedule-IV. 11 Conditions of Service.—(1) An officer appointed to the Service shall be liable to serve anywhere, including field service and in the Army Postal Service, in or outside of India. (2) The conditions of service of the officer of the Service in respect of matters, for which no provision has been made under these rules, shall be the same as are applicable to the officers of Central Civil Services from time to time. Provided that the Government may, if satisfied that such marriage is permissible under the personal law applicable to such person and the other party to the marriage and that there are other grounds for so doing, exempt any person from the operation of this rule. 13 Interpretation.—If any question arises relating to the interpretation of these rules, it shall be referred to the Government who shall decide the same. 14 Power to relax.—Where the Government is of the opinion that it is necessary or expedient to do so, it may, by order, for reasons to be recorded in writing and in consultation with the Union Public Service Commission relax any of the provisions of these rules with respect to any class or category of persons. 15 Saving.—Nothing in these rules shall affect reservations, relaxation of age-limit and other concessions required to be provided for the Scheduled Castes, the Schedules Tribes, ex-Servicemen and other special categories of persons in accordance with the orders issued by the Government from time to time in this regard. 5 Junior Administrative Grade (Non- Functional Selection Grade) Director or Director Postal Services or Additional General Manager or Joint Director, Rafi Ahmed Kidwai National Postal Academy or equivalent. Level 13 (Rs. 1,18,500- 2,14,100) 30% of senior duty posts (i.e. posts in Senior Time Scale and above), provided the total strength including that in Administrative Grade shall not exceed the authorised strength of Junior Administrative Grade. 1 Apex Scale Level 17 in the pay matrix (Rs. 2,25,000) By Promotion Selection Officers of the Service in Higher Administrative Grade+ in level 16 in the pay matrix (Rs. 2,05,400 - 2,24,400) with one year's service in the grade. rendered after appointment thereto on regular basis. 2 Higher Administrative Grade+ Level 16 in the pay matrix (Rs. 2,05,400- 2,24,400) By Promotion Selection Officers of the Service in Higher Administrative Grade in level 15 in the pay matrix (Rs..1,82,200 - 2,24,100) with one year's service in the grade, rendered after appointment thereto on regular basis. 3 Higher Administrative Grade Level 15 in the pay matrix (Rs. 1,82,200 2,24,100) By Promotion Selection Officers of the Service in Senior Administrative Grade in level 14 in the pay matrix (Rs. 1,44,200- 2,18,200) with three years' service in the grade rendered after appointment thereto on regular basis; or with twenty five years' regular service in Group 'A' posts in the service out of which at least one year's regular service should be in Senior Administrative Grade, who have successfully completed minimum two weeks' Advanced Development Programme or Departmental Induction or prescribed in-service Training. 4 Senior Administrative Grade Level 14 in the pay matrix (Rs. 1,44,200- 2,18,200) By Promotion Selection Officers of the Service in the Junior Administrative Grade in level 12 in the pay matrix (Rs. 78,800 - 2,09,200) with eight years' combined service in Junior Administrative Grade and Non-Functional Selection Grade, if any, rendered after appointment thereto on regular basis, or with seventeen years' regular service in Group 'A' posts in the service out of which at least four years' regular service should be in Junior Administrative Grade including Junior Administrative Grade (Non-Functional Selection Grade), who have successfully completed minimum two weeks' Management Development Programme or Departmental Induction or prescribed in- service Training. 5 Junior Administrative Grade (Non- Functional Selection Grade) Level 13 in the pay matrix (Rs. 1,18,500 - 2,14,100) By Placement on the basis of seniority subject to suitability - Officers of the Service in the Junior Administrative Grade in level 12 in the pay matrix (Rs. 78,800 - 2,09,200) who have entered the 14th year of the service on the lst January of the year calculated from the year following the year of examination on the basis of which the member of the Service was recruited, or the year of inclusion in the select list of Junior Time Scale on promotion. 6 Junior Administrative Grade Level 12 in the pay matrix (Rs. 78,800- 2,09,200) By Promotion Selection Officers of the Service in the Senior Time Scale in level 11 in the pay matrix (Rs. 67,700 - 2,08,700) with five years' service in the grade rendered after appointment thereto on regular basis, who have successfully completed minimum two weeks' Executive Development Programme or Departmental Induction or prescribed in-service training. 7 Senior Time Scale Level 11 in the pay matrix (Rs. 67,700- 2,08,700) By Promotion Selection Officers of the Service in the Junior Time Scale in level 10 in the pay matrix (Rs. 56100 — Rs. 1,77,500) with four years' service in the grade rendered after appointment thereto on regular basis, who have successfully completed minimum two weeks' Departmental Induction or prescribed in- service Training. 8 Junior Time Scale Level 10 in the pay matrix (Rs. 56,100- Rs. 1,77,500) (i) 50% by Direct Recruitment (i) Selection (i) Through Civil Services Examination conducted by the Commission. (ii) 50% by Promotion (ii) Selection (ii) Officers of Postal Service, Group '13' in level 9 in the pay matrix (Rs. 53100 — 1,67,800) and Senior Postmaster Grade in level 8 in the pay matrix (Rs. 47600 — 151100) with two years' service in those grades rendered after appointment thereto on regular basis, who have successfully completed minimum two weeks' Departmental Induction Training. Note 1: In all the grades, the crucial date for determining the eligibility of the officers for promotion to various grades shall be as per the instructions issued by the Government from time to time. Note 2: Where juniors who have completed their qualifying or eligibility service are being considered for promotion, their seniors would also be considered provided they are not short of the requisite qualifying or eligibility service by more than half of such qualifying or eligibility service or two years, whichever is less and have successfully completed their probation period for promotion to the next higher grade along with their juniors who have already completed such qualifying or eligibility service. These rules may be called the Indian Postal Service (Group 'A' posts) Recruitment Rules, 2017. They shall come into force on the date of their publication in the Official Gazette.